We have rights. 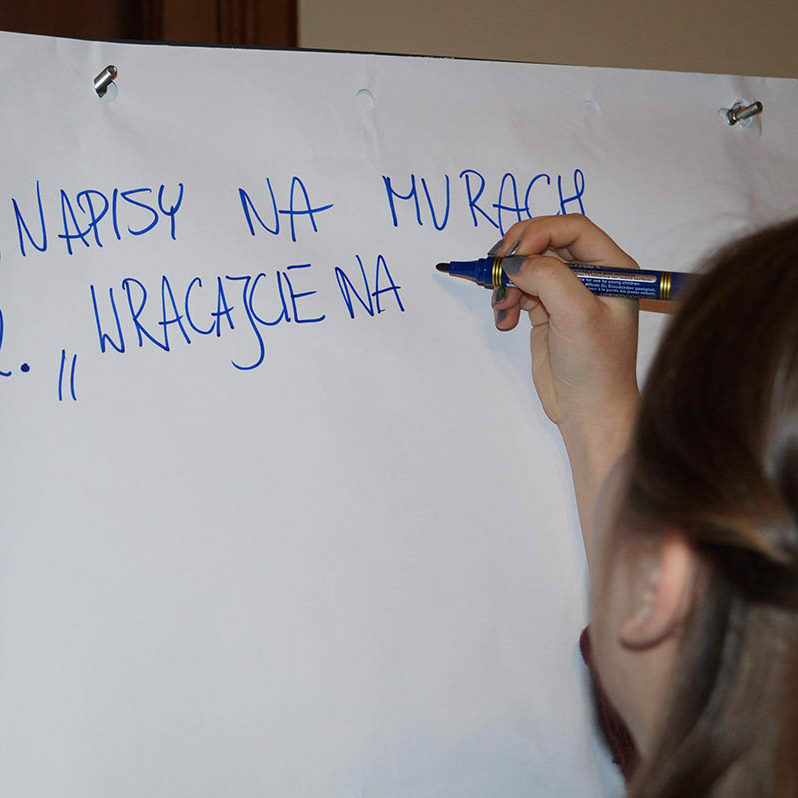 Workshop strengthening the youth group and expands its activist actions. When a group of young, active people, who feel their rights or the rights of others are violated, is formed, it needs knowledge and tooling support to enable them to take further effective action. This workshop builds the basic legal awareness of the state’s obligations towards citizens (including, but sometimes especially, minors), shows a number of possible actions and points out where to turn for support and help. Time: preparations – 1 hour, implementation – 2 godz. What areas of life / topics are described in the documents? What can be done based on them? What can you ask for? What to react to? Against what are you protected? Prepare to share your conclusions with other groups. Ask the group if read rights and information were clear. You can ask how the group understands, for example, the right to dignity (or other rights if necessary)? You may find it worth taking a moment to discuss this and other rights. Definitely worth it, because there are not many such opportunities. Ask how the documents they have just read have are used in the real life – how many people feel that these assurances are respected, that they are free to fulfil their needs, that they are protected. On the flipchart, list the areas, specific rights or freedoms that the group considers unfulfilled or not accepted. Then, let the group choose the most important topics, those they want to address. Let everyone vote on the subject they want to discuss – you can give each person one vote, a few or an unlimited number, but suggest not to vote for everything. You have to start with just one matter. Take care of the topic or topics that have won the most votes. What exact problem do you want to solve? What change do you expect? For starters, pick a very specific thing, not a system change! Who do you turn to? Local community, school, service, office, media, local politicians or parliamentarians from the region, city president or state? Remember that the representatives of the Polish state are obliged to protect your human rights. What do you want to achieve? Show your needs, feelings or views at a topic, change the narrative, raise awareness. What methods will you use? Providing information about a distressing situation, trying to exert pressure, showing support (a meeting, letter, blog, petition, reporting to a city watchman, police, prosecutor or other appropriate office, happening, publicity or demonstration), integration around a topic, information on rights and obligations. During meetings in person, you can get to know the arguments of the other side, throughout many attractive public actions you can involve many people. Who can help you? You will need support – look for allies – educators, lawyers (there are those who work free of charge), local leaders or institutions such as the Ombudsman or NGOs (Polish or international) or perhaps famous people who will advise you and will strengthen your activities, including speaking up alongside yourselves. from Przemysl – both people from the Ukrainian minority and a Pole – based on their experiences and reflections. Movies encourage discussion about stereotypes, prejudices and their consequences for the community. See Minority neighbours scenario. economical, allowing the child to prepare for economic independence from others. The most important one is the right to learn. In addition, the protection of labour law, whether in the context of compulsory education or holiday job. The EU youth strategy envisages, inter alia, that young people are actively involved in social activities and that the governments of Member States like Poland should listen to them and take into account their proposals for the preparation, implementation, and evaluation of strategies and actions, especially those related to education, health, and prosperity. The entire state system should prevent exclusion. supporting the integration of excluded youth.